Looking for a fun way to keep your dog entertained and out of trouble? Try playing some more games with your dog. Games are a great way to exercise your dog, and they help keep your dog busy, active and out of trouble. Not sure where to start? Don’t worry, we’ve got you covered. 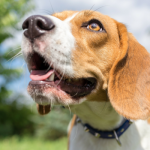 Here’s 10 fun games to play with your dog. One of my favorite games for dogs is using a flirt pole because they’re so easy to use, and because they’re a really quick way to tire out your dog. A flirt pole (also called a flirt stick) is a long pole with a rope attached to the end. On the end of that rope is a lure that’s used to entice your dog to chase. Flirt poles provide great exercise, and they’re mentally stimulating. 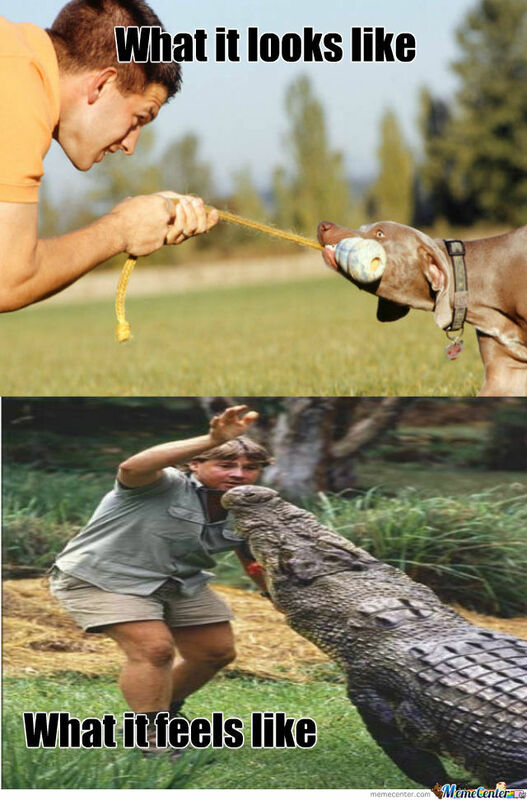 They’re a way to let let your dog use their natural prey drive in a non-destructive way. And they’re a great for practicing some basic impulse control such as letting go on command. When playing remember to let your dog ‘win’ or catch the lure on occasion as a reward. By letting them win you’re making the game more engaging and fun, and that will encourage them to keep playing. If they don’t get that chance to win they can become discouraged and uninterested in the game. You can make your own flirt pole with some pvc pipe, some bungee cord and a dog toy. If you’d rather buy one there’s plenty available on amazon. Remember to take it slow when starting out. Using a flirt pole with your dog is very high impact, and it can be rough on your dog’s joints. 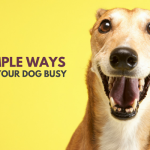 If your dog isn’t very active to begin with start with short sessions and work your way up to longer ones. Word of caution for dogs with arthritis or mobility issues: If your dog has any joint or mobility issues don’t use a flirt pole. Because it’s such a high impact exercise it can cause further joint damage, so opt to some of these lower impact exercises instead. Tug is by far my dog’s favorite game. 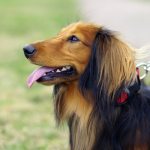 It’s fun, it’s engaging, it’s great physical exercise and it’s a good way for dogs to practice good manners. And if you spent a lot of time training with your dog I’ve found it to be one of most motivating rewards around. Frisbee is a game I refer to as an advanced game of fetch because it promotes your dog to chase over long distances. A game of frisbee is great exercise, and it’s a lot of fun for dogs that have a natural drive to chase. If your dog doesn’t know how to catch a frisbee I’d start out by using a soft disc. Traditional plastic frisbees are pretty hard, so if they hit your dog in the face they can discourage them from trying to catch it. 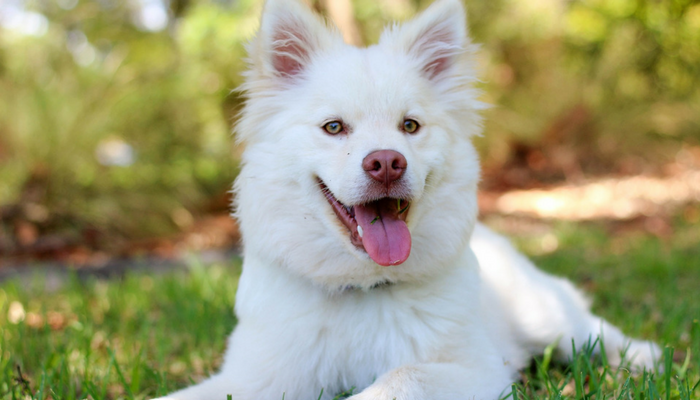 Practice by getting your dog excited about the frisbee by tossing it short distances or rolling it on the ground. Encourage them when they start to follow it around and chase. Once your dog is excited to chase it you can increase the distance and start tossing it. Another fun game for dogs is creating your own agility course. 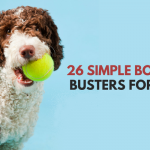 It’s a fun way to teach your dog some new tricks, and it’s a great source of mental stimulation for dogs. Using an agility course for your dog is a fun way to give them some mental & physical exercise. I’ve found that having Laika run through our own little mini course is more tiring than a 2 mile walk. It’s that added focus of having to perform one thing after the other that’s really exhausting. 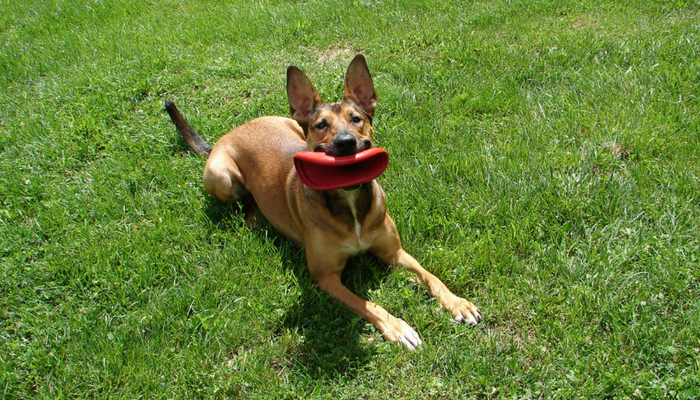 Using a stuffed Kong or some food dispensing toys is one of the easiest games to play with your dog. It’s fun, it encourages them to use some of their natural scavenging ability, and it’s mentally stimulating. If you’re not a fan of Kongs check out the West Paw Tux toy — it’s my favorite alternative. Stuffing a Kong is my personal favorite because it can keep Laika busy for 30+ minutes. I’ll stuff it with some healthy treats and broth and freeze it over night. If your dog gets a little stressed out each morning when you leave for work try giving them a stuffed Kong. It worked well for Laika, after a few days she was more interested in getting than Kong than she was with the fact that I was leaving. If your dog doesn’t know how to chase bubbles start by blowing a couple at a time. Point them out to them and encourage them to chase. Catch some yourself to show you dog that there’s nothing to worry about, and that the whole point of the game is to get them before they touch the ground. We use bubbles made for kids (they also make flavored bubbles specifically for dogs). They’re non toxic, but can upset their stomach if they ingest too much. And be sure to wipe off your dog’s face afterwards because they can irritate your dog’s eyes. 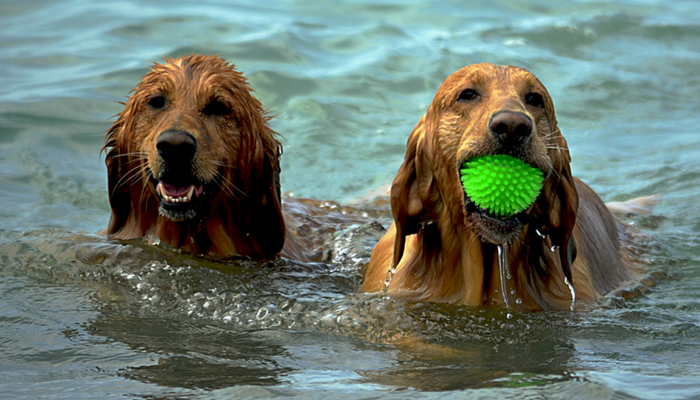 Going to the local beach can be a lot of fun for dogs, especially those that already love swimming. (don’t forget a doggie life jacket for safety) You can bring along some dog toys and play a game of fetch in the water. Just remember to check if they float first – we’ve lost a few toys in the water much to Laika’s dismay. If your dog isn’t a great swimmer, or if you don’t have any beaches nearby you can play some water games in your own backyard. Get a plastic kiddie pool and fill it with water. Many dogs love splashing around and having a nice little pool of their own to keep cool in. Toss in some toys and turn it into a ‘bobbing for apples‘ game. Some dogs go crazy for the hose. I know all I have to do it get within 10 feet of the hose and Laika’s by my side waiting for that fun stream of water to begin. But the hose is pretty intimidating for some dogs. If your dog isn’t into the hose they might prefer playing in a sprinkler that doesn’t let off such a strong stream of water. My dog never gets tired of the find the treats game. It doesn’t matter that I pick the same 20 hiding spots and that we always play with chopped up carrots – she loves it every single time. My lack of creativity doesn’t bother her at all. Find the treats, like all nose work games, are mentally stimulating and a fun way to let our dogs hone in on their natural sniffing abilities. Some dogs love digging, and having a dedicated digging box for them is a way to encourage them to dig in one approved area – one that doesn’t include your landscaped garden. You can make your own digging box with some wood and sand from your local hardware store. If you have a lot of cats in the neighborhood you might want to build a top to keep it from becoming a litter box. Some dogs will be thrilled to have a place to dig to their heart’s content. If your dog doesn’t dig right away you can make it game by burying some of your dogs favorite toys in the box to encouraging your dog to dig them out. Laika loves a game of hide and seek, and it still surprises me that she’s not sick of it even though I keep picking the same 3 hiding spots over and over. Hide and seek lets your dog use some of their natural scent tracking abilities in a fun and stimulating way. 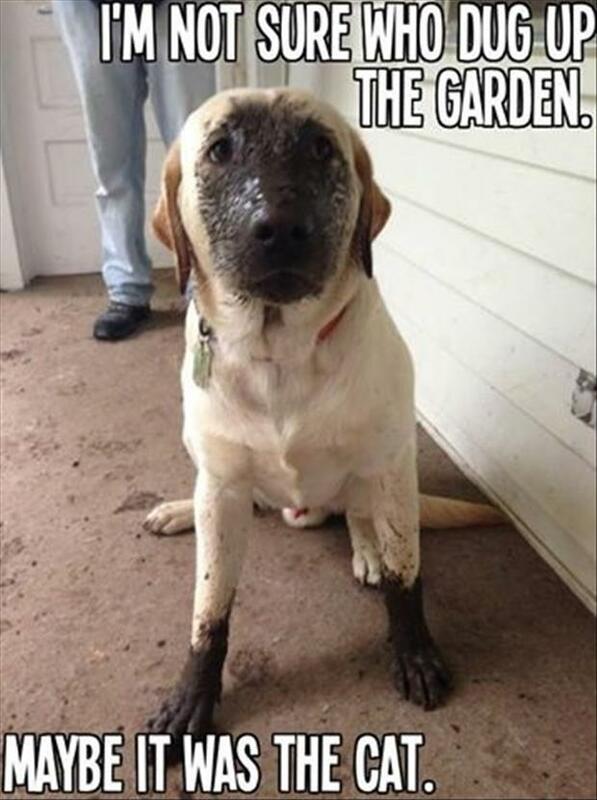 To play hide and seek have you dog stay while you go find a hiding spot. Once situated call your dog and praise them when they find you. If your dog doesn’t have a good ‘stay’ you can enlist the help of someone else to distract your dog as you hide. What Are Your Dogs Favorite Games? What are your favorite games to play with your dog? Which games does your dog prefer playing? Do you think playing games with your dog is an important part of the dog-owner relationship? We use the find it game. That is the one we play in the house the most. I’ve also started using it with Delilah in the driveway when we come back from our walk. I will unclip her and throw a treat, telling her to find it. Sometimes she sees it fall, and sometimes she has to sniff it out. The main goal for me is to work with her off-leash. I think she is slowly coming to terms that sticking close with me is what gets her the reward. Spirit loves to play hide and seek. When he finds me he gets a nice treat. I love watching him look in all the spots I hide in and then he stands and listens for me. My cavapoo puppy loves to play Tag and Tug of War 🙂 Her favorite toy is a sock! My puppies love to play tug-of-war and hide and go seek! Its hilarious when they win. They don’t really like our hose, though they love jumping into our little pond. I’ve got a 5 month-old black lurcher. She loves to play tug of war, she’s becoming so good at it and I have so much fun playing with her.